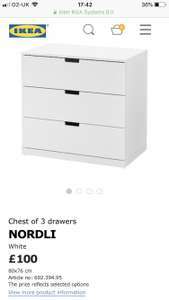 These drawers are currently still listed as £100 on IKEA website but are in the bargain corner for £15. I was planning on buying the Malm drawers but saw these and saved over £100. There was lots left too. Link doesn't work?Where is the bargain corner access. Are you from future with VR on for shopping? Is it the 80cm x 76cm size please? Good call, I could be doing with a change of drawers!! Where is the bargain corner access. are they built or boxed? We've been - they had two already built in that size in the corner that a family were disassembling to buy. Rest scanning full price. Don't waste your petrol! Thought bargain corner was for soiled goods? How many were left ? Ahh didn’t realise this was a bargain corner deal before voting! Bargain Corner desks are store specific and either damaged, bits missing, returned, refurbished or ex demo. Can def find some good deals but this def won’t be in all stores, and even if you find one it might be a different price. You’ve got to have good luck!